Preschoolers at the age between 3 to 5 years old are better at listening to instructions and more independent. This is the perfect time to get your child to learn new things and be more independent. They will get to learn swimming techniques like blowing bubbles, starfish float and back float without assistance. At the age between 3 to 5 years old, preschoolers can better listen and understand the instructions given by the swimming coach, they are also more independent at this point. New swimming techniques will be introduced and they will be learning swimming skills like kicking with a float, proper wearing of swimming goggles and picking up objects underwater. Confident preschoolers can start to learn the front crawl or swim forward 10 metres independently using the “swim breathe swim” or the “swim float swim” techniques. Every child is unique and their progression in swimming proficiency varies from child to child. At Smile Swimmers, we employ a nationally recognised, progressive and step-by-step teaching syllabus, to impart the right swimming skills to your child. This is to prepare your child and help them safely attain the various SwimSafer™ certification badges (6 stages) during our Kids Swimming Lessons. Each child will receive a complimentary SmileSwimmers’ Starter Kit that contains a swim cap and a pair of goggles to kickstart one of the milestones in their life. Every child is born a natural swimmer and often without fear of water, like a “fish in water”. Learning how to swim not just keep your little ones safe, it also strengthens them both physically and mentally. During the lesson, parents are encouraged to participate together as it is an excellent opportunity for you to bond and observe your child develop their love of floating in a weightless, calm and safe environment. When you introduced your child to activities like swimming at an early age, it helps your little one to eliminate any possible fear of water, instil confidence and develop a sense of independence in them. Give your pre-schooling child the chance to become a water baby today. Sign up for our trial preschooler swimming class! Coach Kidd has been coaching swimming classes since 2005. 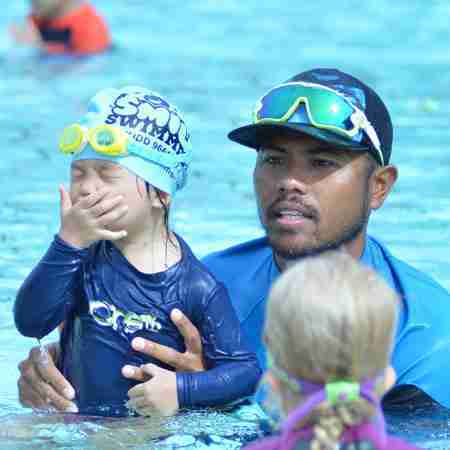 Smile Swimmers is built on his strong passion for swimming and hoping to impart his knowledge about the sports to children of all ages. Q: My child is 2 years old, can he/she join this class instead? A: It’s better if your child joins the Toddlers Class first, once your child is 2.5 years old he/she can then join our Preschool Group Classes. Q: But my child is very confident and comfortable with strangers, can he/she still join? A: If thats the case then we can assess and evaluate your child. If your child is ready, we would definitely love to accept your child into this class instead. Q: What will my child learn in this class? A: In the Preschool Class, we want your child to be confident in the water without having parents accompanying them. So the for most thing we will doing is to build up the confidence of your child by learning how to hold their breath and blowing bubbles while submerged underwater. From there onwards, It will be an open door to work on the various swimming skills. Q: Will my child get certification after the term? A: It depends on your child. Some 4 year olds are fast learners so they may be able to learn to forward swim or even the front crawl at such a young age. If we feel they are ready, we will definitely send them for the swim safer test. Otherwise, not to worry as mastering the basics first would be the better option instead of pressuring your child. Once we feel your child has mastered the basics, we will advice you how to move forward from there. Q: How long is the class and how many students are attending each class? A: 30 minutes per class with a maximum of 8 students. Q: Will my child get enough attention to learn? A: Yes. Coach Kidd is very experienced and he specialises in these areas so your child is in good hands. But of course if we feel that your child needs more attention, we may suggest them going for private classes. Unsure About Our Preschoolers Swimming Lessons? Speak to Coach Kidd to find out more about how our preschoolers swimming lessons can help your child.